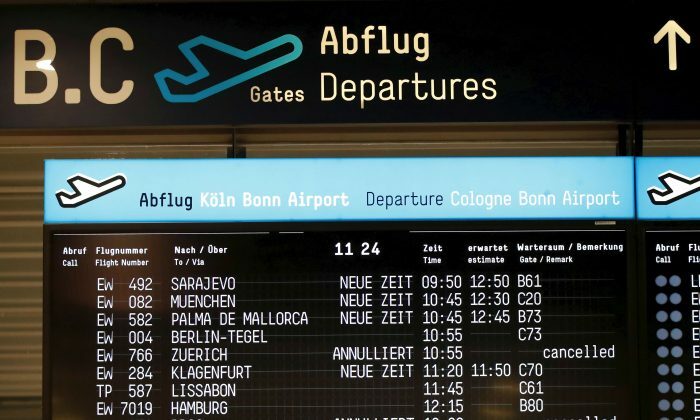 BERLIN—European airline passengers are likely to face flight delays and cancellations again this summer because of shortages of air traffic controllers, the head of the German aviation association BDL warned on Feb. 7. Europe’s airports are struggling to cope with greater demand for travel and a lack of capacity on the ground. Airlines blamed air traffic control as the reason for flight delays last summer, citing strikes in France and staff shortages. On Feb. 4, Ryanair’s chief executive said he expects a “torrid time” in the four months to June because of shortages of air traffic controllers. German airline Lufthansa spent 500 million euros ($570 million) last year on compensating passengers for delays and cancellations, an executive said last week. BDL President Klaus-Dieter Scheurle said he expects further disruption this year, despite the German aviation sector agreeing on measures last October to try to avoid backlogs. “We must expect that summer 2019 will also be difficult, but we will have to wait and see by how much,” Scheurle said in an online briefing. Germany’s air traffic control (DFS) has increased the number of training places to 120 and is trying to recruit trained air traffic controllers from abroad to ease the bottlenecks. In July 2018, 8 percent of all European flights were delayed by more than one hour, up from 5.5 percent in 2017, BDL said, citing data from the Central Office for Delay Analysis. This wasn’t only due to problems in air traffic control, but also strikes in southern Europe, an unusually high number of storms, as well as backlogs at airport security, BDL said. Overall, the number of passengers at German airports rose by 4.1 percent last year to 244 million. That underperformed Europe as a whole, which had growth of almost 6 percent. BDL’s Scheuerle said competition in the industry remains intense. German airlines lost market share to low-cost rivals Easyjet and Ryanair in the wake of the collapse of Air Berlin, BDL data showed. The market share of German airlines, as measured by the number of seats, fell to 57 percent between Jan-Oct 2018, compared to 62 percent a year earlier. Scheuerle said he expects a further fall in market share following the insolvency of holiday airline Germania earlier this week.